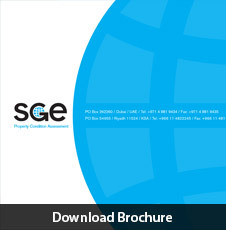 SGE is the region's leading independent third party Property Inspection company with internationally qualified, accredited and experienced consultants. Our team of professionals boasts of extensive experience in the American market where a strict adherence to codes and quality is a norm. We intend to inspire the same degree of confidence in our Middle East clients. Heading SGE in the Middle East is Allen Gantt. Allen has more than 17 years of experience living and working around the world - focused on construction, entrepreneurial ventures and implementation of best practice methodologies across a range of industries. Prior to joining SGE, Allen founded, operated and sold an international construction company that built commercial and residential properties in USA, Africa, Asia, and the Middle East. Allen's passion with Property Inspections is rooted in his firsthand experience of construction expectations and property maintenance. He believes that transparency is pivotal to raise the level of credibility of the construction and maintenance industry in this region and that SGE is best poised to provide that transparency. Allen's experience in the global real estate industry coupled with years of providing international consultancy services to property investors ensures a clear vision for SGE – to be recognized as the region's leading independent third party professionals whose assessment you can completely trust and rely on to make sound business decisions. Hocine heads SGE's Property Inspection division. With over 30 years' experience and individually having conducted over 600 Property Inspections in the United States, Hocine is one of the pioneers of Property Inspection. He has led teams in inspecting all kinds of developments from exclusive residential communities to large-scale commercial facilities; and has also worked alongside Charles McClain, author of Property Condition Assessment Handbook, one of the foremost books on Property Inspection. Hocine was employed by the biggest American Property Inspection companies such as EMG, BE, Building Analytics, Marx Okubo and Property Inspection LL; his in depth experience is matched by his outstanding qualifications. He holds a Master's degree in Mechanical Engineering from Illinois Institute of Technology in Chicago, USA, a Certificate of Engineering from UC Berkeley and Management Certifications from the American Management Association. Hocine is a licensed Professional Engineer in the State of California, USA and a Certified Energy Manager (CEM). Maher joined SGE in 2012. He has more than 25 years of experience in Construction Management and Facilities Operation with a background in mechanical engineering and management. Prior to joining SGE, Maher co-founded a consulting engineering and project management firm with offices in Dubai, Abu Dhabi and Lebanon. He also held the positions of director of sustainability and facilities management at a major International project and construction management (PM/CM) firm. Prior to that, he held a regional managerial role working for a Fortune 500 firm that manufactures air conditioning products and provides energy management for buildings. Focusing on Life Cycle Cost with a keen interest in air conditioning design, energy consumption, and indoor air quality, Maher has a proven track record in successfully employing best of breed practices that improve efficiencies in buildings, reducing operating costs and improving reliability as a result. Maher graduated with an MSc in Engineering from Stanford University and a BSc in Engineering from Syracuse University. In addition to the core team, here in the UAE, SGE has teamed up with the most qualified and experienced professionals in the industry, including internationally licensed architects and engineers from all disciplines. They are backed up by an in house administrative and operations team that come from four continents and speak eight languages.